Betting in sports has been around for many centuries, and there are hardly any sports where betting does not take place. In many countries sports betting is illegal, but it still happens because of the inherent demand for such betting. While many bets for just for the fun of it, there are others who bet because they want to make some money out of it. There are quite a few sports activities which have become popular only because they allow betting and horse racing is in such sport. Betting and horse racing have a close relationship with one another, and they have been this way for centuries. Hence, there is hardly any horse racing today without betting involved in it. The betting could run into thousands of pounds, and worldwide horse race betting, greyhound betting, and other such animal racing based betting could be worth a few billion dollars. As far as Great Britain in general and England is concerned, horse racing has been around for many decades or perhaps a few centuries now. It would be pertinent to mention that horse racing in London and England could be the second largest spectator sport. It's history as mentioned earlier dates to a few centuries and it contributes around 4 billion pounds to the British economy. Though there could be divided opinions about the morality and other factors regarding the sport at the end of the day, there is hardly any doubt that it is a sport which both interest and revenues and it continues to grow quite satisfactorily. As far horse racing in England and London is concerned, there are basically two types, and both are unique and versatile. Flat racing is the most common which is run for distances of 5 furlongs and it could also be 2 miles, 5 furlongs and 159 yards if there are courses without any obstacles. On the other hand, when we talk about National Hunt Racing we are referring to races which are run over distances of 2 miles and 4 1/2 miles. Here the horses are made to jump either hurdles or fences and these are also referred to as steeplechases. In fact, steeplechase is an important sporting track event in the Olympics too. In fact, there are also a few National Hunt races called by the name National Hunt Flat Races where the races take place under the National Hunt Rules but were not obstacles are required to be crossed by the horses. As far as Great Britain is concerned, there are 59 licensed racecourse grounds. Another two are there in Northern Ireland. The oldest is Chester Racecourse which was used for the first time sometime during the 16th century. Races in London usually take place on the turf unlike countries like the USA where it also takes place on other surfaces also. But there are five courses which are suitable for use across all weathers. It would be pertinent to mention here that Wolverhampton has come up with a Tapeta surface since August 2014 which replaced the already existing Polytrack. While there are a few horse racing events, that takes place across the length and breadth of England and London, you must as a punter and bettor know how to make the best use of it. The first and foremost thing is to ensure, that you focus on the right type and form of races. You have to bear in mind that horse racing in London is spread throughout the entire year. Hence, you must take some time out get some useful information and then decide as to which the best way forward is. For example, it would not be a bad idea to focus on horse races such as Cheltenham Festival or Grand National horse racing festival. The best thing is that with the freedom to choose from a range of markets. 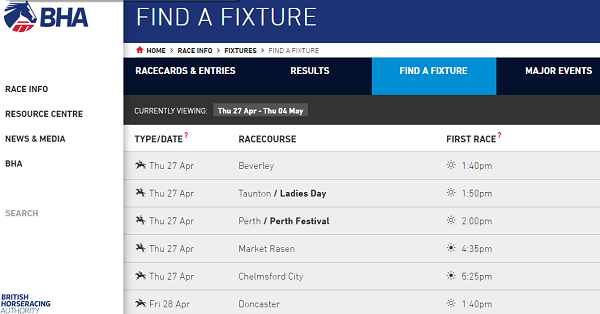 Though opting for a single win or each way might sound interesting, there are bookmakers who are ready to offer numerous markets as far as horse racing in this part of the country is concerned. While identifying the right race is vital, in the same light you must also spend some time and ensure that you choose the right bookmakers. They will help you in coming out with the right odds and provide the right information as far as the current, previous and historical form of horses, jockeys and trainers are concerned. As far as odds are concerned the early favorites appear to be those horses which have done consistently well over the years and across various circuits as far as that year is concerned. The best way to know more about it is to visit the various bookmaker websites. You will get clear information about the current odds of big names and other details such as possible win percentages and so on. Taking these details into account it would be possible for punters to take the right decision. Another important aspect is to have a reasonably good idea about the various races and horses on a continuous basis. For this to happen, you must try and follow the right tips. There is a tendency to often fall for overhyped horses, and this should always be avoided. Whenever you start relying heavily on these overhyped horses, you tended to throw value and established norms and practices out of the window. How to Choose the Winning Horse? Horse racing in England and London is quite complicated. Hence, it might not be possible to give a straight jacket answer to the question as to how to choose the winning horse. There are a few permutations and combinations which might need to be used. The form of the horse, its odds, and what other bookmakers have to say and what bettors feel about it are important attributes and points which must always be kept in mind.